A Shenandoah Sampler: My First Post!! Wow! I can hardly believe it...my first blog post! I have been using computers for over 20 years now and this is my first blog. Well, I guess better late than never! 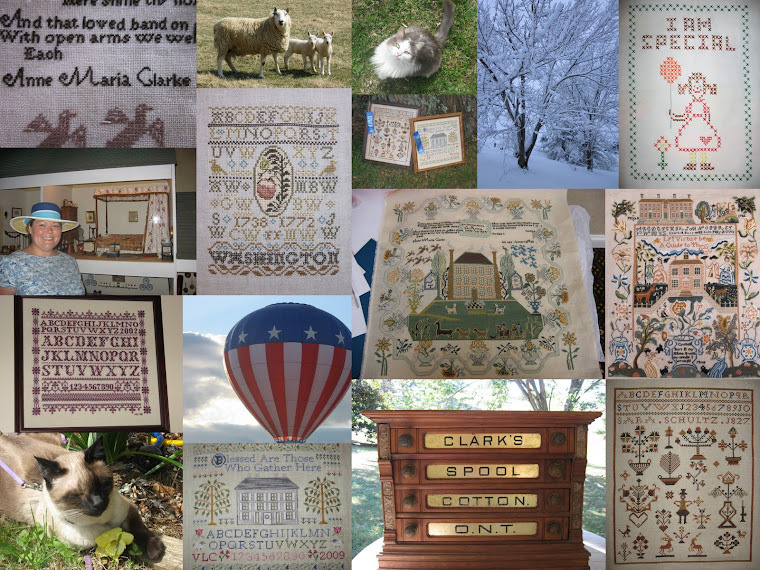 I have decided to start a blog so that I would have an outlet for one of my favorite hobbies/obsession...needlework, specifically samplers. I have been stitching since I was about 9 years old (24 years!) and have started many projects but finished few. I have gone for long stretches of time without stitching on something. But I always seem to come back to my needlework and usually for the same reason...the feeling that I am a part of a long-standing tradition and that through my needle I am a part of history. For some time now, I have had a strong interest in antique samplers. This interest has quickly turned into a love and appreciation for antique needlework. I recently visited the Colonial Williamsburg museums and was lucky enough to have a peek into their "drawers." What I found was a treasure of beautiful samplers many of which I had seen only in books and magazines. That experience was amazing and has left me wanting more. Therefore, I am starting to blog about my new obsession but I am also going to document my WIP's. I don't have a single acquaintance that is remotely interested in needlework, so my blog will be my outlet. I look forward to any and all comments and meeting some wonderful people!